(Melanie Arter – CNS News) A story time event at a Lansdale, Pa., library that was organized by drag queens was the target of protests on Saturday. Counter-protesters also turned out in support of the story hour. The event, called “Drag Queen Story Fun Time with Annie,” featured a drag queen named Annie Christ – which can be interpreted to mean the anti-Christ, a local Fox affiliate reported. She read from the book, “Naked Mole Rat Gets Dressed” by Mo Willems. The Pennsylvania Pastors Network protested the event, saying Annie Christ is “clearly attacking Christianity by wearing satanic symbols. 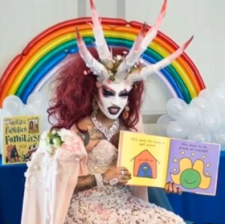 They pointed out the drag queen also performs lewd sexually charged nightclub shows and shouldn’t have been allowed to present a story time for children,” CBN News reported.